Welcome to the Cheery Lynn Designs July Vintage New Release Blog Hop. Be sure to hop along to all the stops and then comment on the post on the Cheery Lynn Blog answering one or more of the questions for a chance to win a $20 gift certificate to Cheery Lynn Designs. 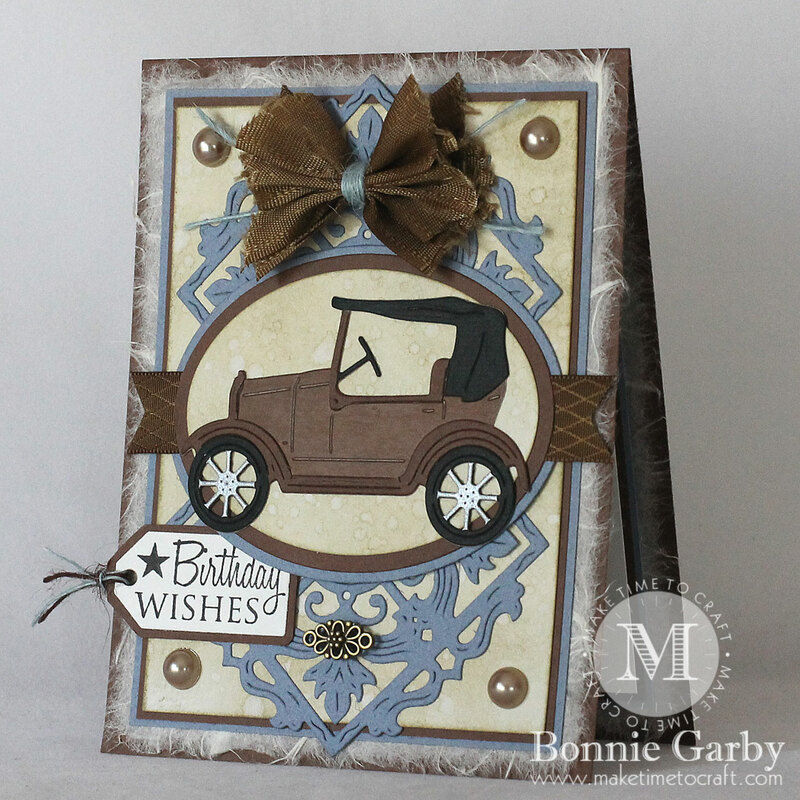 My card is A2 size (4-1/4″ x 5-1/2″) with a dark brown base. I created some ivory background paper using Distress Inks. 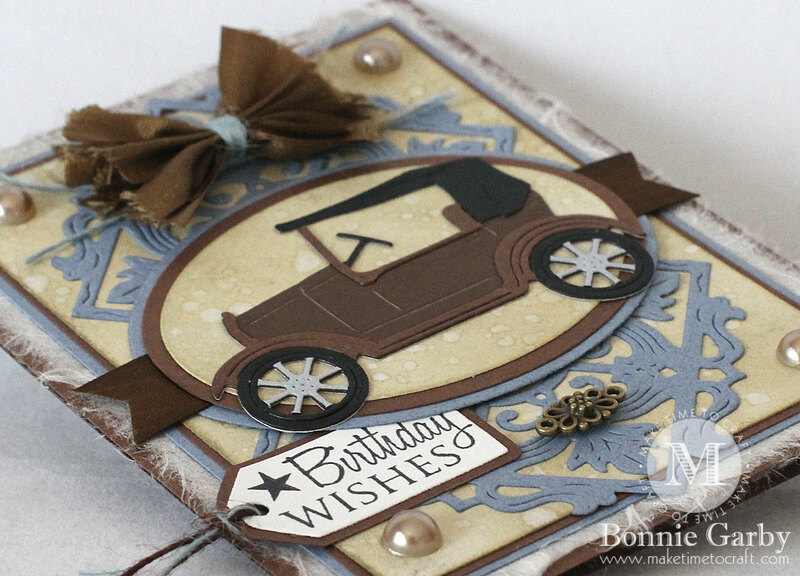 I created some layers with blue and dark brown card stock along with natural mulberry paper. That was topped off with the distress ink paper I made. I cut the Vintage Tile die out of blue card stock twice to stack on my card. 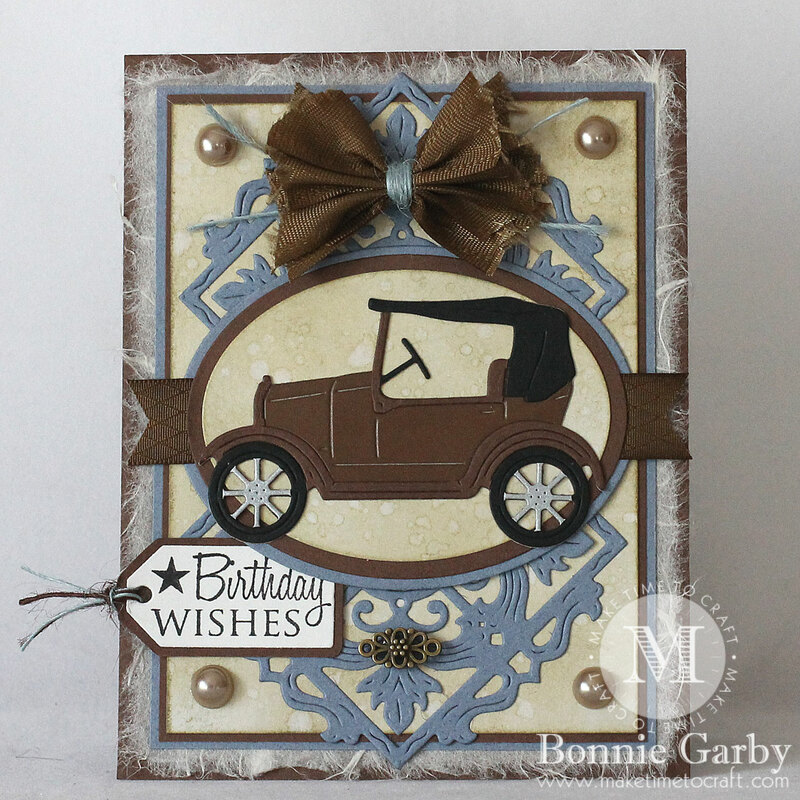 I cut the Tin Lizze in dark brown, black and silver card stock and cut out different areas of each and added them to a base car which I cut out of dark brown metallic card stock to show off all the intricate details. I layered the card on to my oval medallion and centered it on top of a dove tailed piece of brown ribbon. I stamped my sentiment on cream card stock and cut using one of the Nesting Doll Tag dies and added it to the bottom left of my card.I finished things off with a shabby bow and some golden brown half pearls along with a pretty Antique Bronze Vintage Flower Charm. My shabby bow was created on my Bow-it-All V3.0 using Turftan Brown Delicate Stitched Satin Ribbon and Light Blue Burlap String from Really Reasonable Ribbon. Thanks so much for stopping by today. Your next stop is Jenny’s fabulous blog. Great male card. Thank you for joining us at Jo’s Funday Friday Challenge . Good luck with your entry. What a great guy card – the diamond shape bg die is wonderful. This card is amazing! Cherry Lynn makes the best dies! Gorgeous card. Love the dies you used. Thanks for sharing with us at Creative Moment. I always appreciate a well done masculine card but yours really rocks! Of course, your bow are always the best and you manage a bow on a guy card without a problem! WOW! This is stunning! 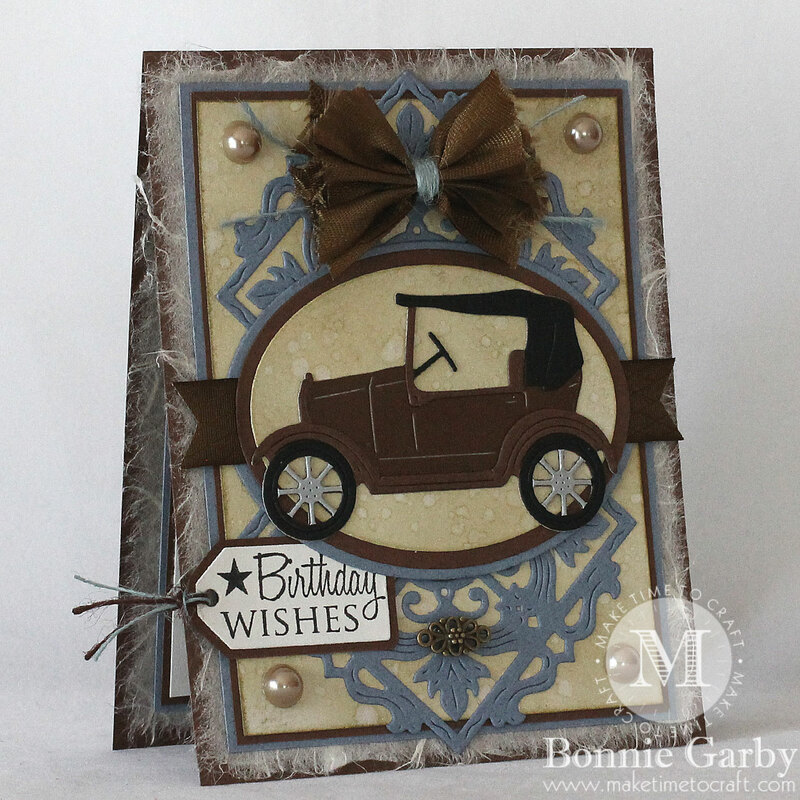 Love that vintage car die and your design. Thank you for linking this gorgeous make with Scrapy Land challenge. This classic car is adorable! Thank you for playing witf us at Scrapy Land Challenge. Oh I love everything about this card! AND I mean everything! WOW!! Thanks for joining us at Crafty Gals Corner! A Super masculine card. Love it. It has lots of texture for our challenge at The Male Room texture challenge. Faith DT. Nice colors for this great vintage look. Thanks for playing along in the Friday Funday Challenge. I do like the colours you’ve used on this card. Great theme and lots of texture. Love the mulberry paper. Thanks so much for playing along with The Male Room, and I’m sorry to be so late commenting! Deborah, DT. Great card/die for a guy!